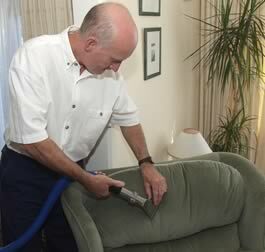 The cleaning of upholstery fabrics in-situ is the domain of a fully trained cleaning professional. It amazes us that unqualified persons use inferior chemicals and equipment on a three piece suite, that can have a value of £2000-£3000. Apex have been in the cleaning industry for twenty five years and we still hear reports of disasters by so called upholstery cleaning specialists. So as to ascertain the correct method of cleaning your upholstery our priority is inspection and testing as modern fabrics may contain several different fibres which have to be identified. We always explain the method of work and carry out the job to your satisfaction. Drying times are also kept to a minimum.